Unlatch the retaining clips A . Pull up at points B and remove. Pull up and remove air cleaner housing C .
Remove the air cleaner filter, Wipe the inside of the air cleaner filter housing and the cover with a damp cloth, then replace air cleaner filter. After installing a new air cleaner, make sure the air cleaner cover is seated in the housing and latch the clips. Operating the engine with the air cleaner removed can cause you or others to be burned. The air cleaner not only cleans the air, it stops the flame if the engine backfires. If it isn’t there, and the engine backfires, you could be burned. Do not drive with the air cleaner removed, and be careful when working on the engine with the air cleaner removed. 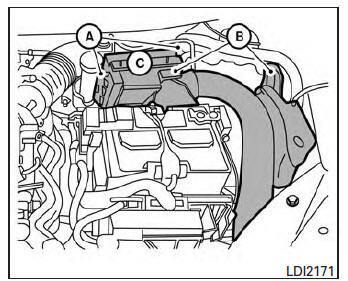 Never pour fuel into the throttle body or attempt to start the engine with the air cleaner removed. Doing so could result in serious injury. The in-cabin microfilter restricts the entry of airborne dust and pollen particles and reduces some objectionable outside odors. The filter is located behind the trim panel near the accelerator pedal. Refer to the “NISSAN Service and Maintenance Guide” for change intervals. If replacement is required, see your NISSAN dealer.